Kit and her father Rudy are moving from Montana to the posh Covington Academy in England where her father is the new equestrian supervisor. Kit is excited to be in a new country where no one knows about her embarrassing fall from a horse that has left her reluctant to get back on, and it's also a new adventure that her deceased mother would have embraced. The downside? Everyone at Covington rides, and the headmistress is a stickler for rules, which Kit, being an American, doesn't care much for. Kit's roommate, Anya, is very nice, as are several of the cute boys, but the head prefect, Elaine, is not happy to have Kit and her headstrong ways in her house. When Headmistress Covington wants to remove an unteachable, headstrong horse, Kit throws a fit and the horse is allowed to stay as long as Kit can bring the animal up to the competition level the school needs to defeat their rival. 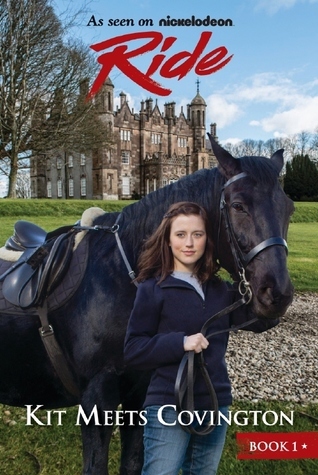 This, of course, is a rocky process, but with the help of her father and her new friends, Kit tries to train the horse and settle into her new life in England. Kit will amuse young readers who like to think that adults make silly rules. I personally think it would be fantastic to have a school uniform complete with blazer and pleated skirt with tights, but that's just me! Kit is irrepressible and tries to do what she thinks is right even if the adults in her life are not quite as sure about it. Boarding school books are always fun, and Anya, who is hiding her background as a princess, is a character who could use more exploration. Nav and Josh are appealing boy characters who treat the girls as equals but are also willing to ask them to dances. Headmistress Covington is a rule follower, but is human enough to bend the rules when necessary. There is apparently a Nickelodeon television series called Ride, but the book can be enjoyed even by readers who are not familiar with it. The details about horse riding are going to be the real pull. Horses who are underdogs always figure largely in books about equestrian pursuits, and TK's relationship with Kit will have readers rooting for him to stay at Covington. Readers who enjoyed Hapka's Ponies of Chincoteague, Smiley's The Georges and the Jewels or Burkhart's Wild Hearts will find it easy to get back in the saddle with Kit Meets Covington.